With a win tonight against the New York Knights in the final week of the regular season, the New Jersey Knockouts would be guaranteed of a playoff spot in the U.S. Chess League. Even a drawn match would keep NJKO's playoff hopes alive, but they would need help from other teams. Earlier this season when these same two teams met, New Jersey emerged victorious over New York. 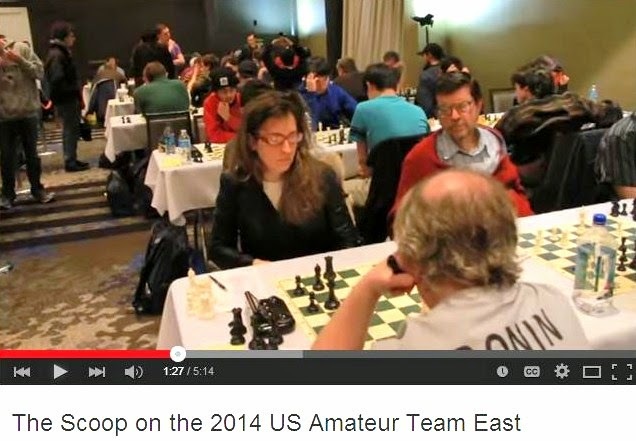 In a previous blog post, I mentioned allegations by Sam Sloan that Susan Polgar and Paul Truong used electronic means to harass him, thus calling into question Sloan's defeat in the recent USCF executive board election. 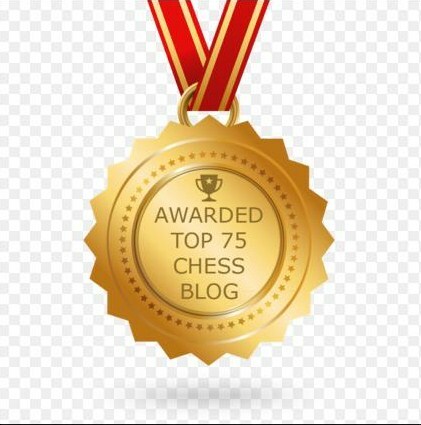 At her blog, Susan Polgar has responded. By the way, I wonder why the Polgar Chess Center's events calendar has not been updated since approximately the same time that Sloan filed his lawsuit. Although October is nearly over, the September schedule still shows on Polgar's website. In case you missed it, former world champion Garry Kasparov was interviewed last Wednesday by Chris Matthews on MSNBC's program Hardball. Here is a transcript of the entire broadcast. My best games were played as Black in today's game/30 Swiss at the Marshall Chess Club. 51.Bd1 Bf2 52.Ke2 Be3 53.Bc2 Kf4 54.Bd3 Kg4 55.Bc2 f4 56.Be4 Kg3 57.Kf1 f3 58.Bd3 Bd2 59.Bf5 Kf4 60.Bc2 Ke3, White resigns. 27.g3 Ng6 28.Kg2 Ne5 29.Nxe5 Bxe5 30.f4, draw. 45.hxg5 fxg5 46.Rh6 Rb2+ 47.Kg1 h4 48.gxh4 gxh4 49.Rxh4 b4 50.Kf1, draw. At today's Viking Quads in Mount Arlington, I won this game in an unusual variation. 53.Kg2 Rc1 54.dxe4 fxe4 55.h5 Rxc4 56.h6 Kf7 57.Nh3 Rc5 58.h7 Kg7 59.Rd8 Kxh7 60.Rxd4 Kg6 61.Nf2 Rc2 62.Kf1 Kf5 63.Nd1 Rc1 64.Ke2 Nd5 65.Kd2 Ra1 66.Rc4 Rxd1+, White resigns. For the second week in a row, the New Jersey Knockouts drew a match in the United States Chess League. In week 8, their match against the Boston Blitz ended in a tie. On Wednesday night, in week 9, the NJKO fought to a 2-2-0 draw versus the Baltimore Kingfishers. I found Atomic Patzer (Master?) chess blog interesting, but as of October 20, 2007 his blog is off line . 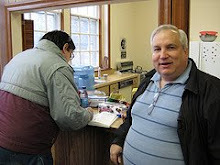 I know Atomic Patzer got shut out in quad 5, at Hamilton chess quads on Saturday Oct. 20, 2007 with zero points. 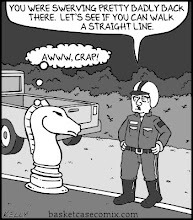 Do you know if Thomas's chess blog will ever come back on line, or is he on temporary hiatus and regrouping his efforts? I am glad to report that Atomic Patzer is back. Unfortunately, all of his previous posts have been lost. Kasparov on CNN's "Late Edition"
On Sunday morning, Garry Kasparov was interviewed by Wolf Blitzer on CNN's Late Edition. Here is a transcript of the entire program, as well as excerpts from the Kasparov interview. Kasparov on HBO's "Real Time"
Former world champion Garry Kasparov made an appearance Friday night on HBO's Real Time with Bill Maher. Although I missed the original broadcast, HBO re-aired the program last night and I watched it. Earlier in the show, former U.S. senator John Edwards was interviewed by Bill Maher and gave all the politically correct answers. By comparison, Kasparov was frank and candid in his responses, as you can see in this segment. 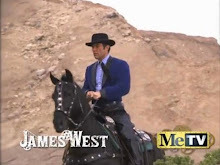 In addition to his appearance in a television commercial for HIP (Health Plan of New York), Asa Hoffmann is also featured in their newspaper advertisements as well. 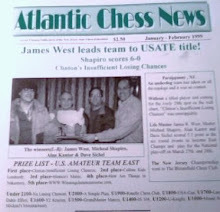 Yesterday, at the Marshall Chess Club, one such ad was hanging on the bulletin board. Players told me that the ads can be found in the Daily News and the Post. One player mentioned that he saw Asa Hoffmann's TV commercial during the 5 o'clock news on Channel 7. In that commercial, the position on the chess board is one that occurred in analysis to Hoffmann's victory against Bobby Fischer in blitz chess. The moves of the game can be found in Hoffmann's book Chess Gladiator, which also contains one of his wins against me. 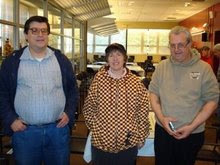 In today's 4-round Swiss at the Marshall Chess Club, I finished with a score of 2-1-1. Here is my best game, which is also the shortest! 8.Nfd2 Nxd2 9.Bxd2 a5 10.b3?! Bf5! 11.Be2 Bxb1 12.Rxb1 Bxa3 13.Bf3 Bb4 14.Bxc6 bxc6 15.Ra1 Ke7 16.Ra4 Rhd8 17.Ra2?? Rxd2!, White resigns. I just got home from today's Hamilton Quads where I played this game in the final round. 66.Ne6 Rxg6+ 67.Ke5 Rg1 68.d6 Rd1 69.Nd4 Re1+ 70.Kd5 Re8 71.Nc6 Kxh7 72.d7 Rg8 73.Kc5 Kg7 74.Kd6 Kf6 75.d8=Q+ Rxd8+ 76.Nxd8, draw. Kasparov on "The Colbert Report"
For those of you who missed Garry Kasparov's appearance on Comedy Central's The Colbert Report on Wednesday night (I caught the re-run on Thursday morning), you can find it here. Of all my posts at Jim West Talks Chess, this entry on the Chigorin Defense seems to have been viewed at a faster rate than any other. The only reason why I don't play it more often is that many players as White answer 1.d4 d5 with 2.Nf3 instead of 2.c4, probably to avoid the Slav Defense (2...c6) which is scoring well for Black these days at the grandmaster level. Michael Goeller of The Kenilworthian previews tonight's match in the USCL between the New Jersey Knockouts and the Boston Blitz. Last Thursday, former world champion Garry Kasparov gave a speech at the World Business Forum in New York City. In a previous post regarding the origin of "patsy", I mentioned that language maven William Safire had written about chess expressions such as "zugzwang" and "sandbagging" in his On Language column. Here is the article on "zugzwang" from The New York Times Sunday magazine of December 8, 1985. 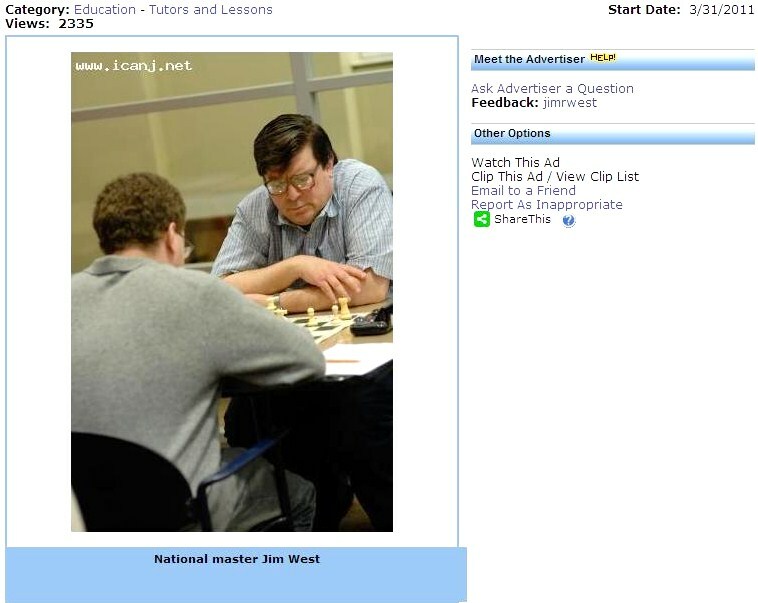 Unfortunately, the title of this post does not refer to a game of chess between Sam Sloan and the consultation team of Susan Polgar and Paul Truong. It pertains to a lawsuit filed by Sloan against Polgar and Truong in federal court, alleging that they used electronic means to harass and annoy him. In this year's USCF executive board election, Sloan was ousted from his seat while Polgar and Truong were elected. Sloan is seeking a new election, as well as punitive damages. That's the bad news! Mark Weeks of About.com thinks that there is a silver lining inside the cloud. In a field that included 4 masters and 2 experts, I finished first today with a score of 4-1-0 in a game/30 Swiss at Cherry Hill. Here are my winning efforts. 28.h3 Kh8 29.Bh5 Re7 30.Nf4 Rg8 31.g4 fxg4 32.hxg4 Reg7 33.Ne6 Rxg4+ 34.Bxg4 Rxg4+ 35.Kf2 Rg2+ 36.Ke1 Bg3+ 37.Rf2 Bxf2+ 38.Kf1 Rg1+ 39.Kxf2 Rxd1 40.Nxc5 Bb1 41.a3 d3 42.Ke3 Re1+ 43.Kd2 Re2+ 44.Kd1 Bc2+ 45.Kc1 Re5 46.Nd7 Re7 47.Nc5 h5 48.b4 h4 49.Kd2 h3 50.a4 h2 51.b5 h1=Q 52.Kc3 Qe1+, White resigns. 20.Rxe7 Rxe7 21.Re1 Kf8 22.Rxe7 Qxe7 23.Kf2 h6 24.Qe3 Qxe3+ 25.Kxe3 Ke7 26.a4 Ne8 27.b3 Nd6 28.g4 g5 29.Nc5 b6 30.Nd3 a5 31.Ne5 f6 32.Nxc6+ Kd7 33.Na7 f5 34.Nb5 Nxb5 35.axb5 f4+ 36.Kd3 Kc7 37.c4 Kd6 38.cxd5 Kxd5 39.Kc3 Ke6 40.Kc4 Kd6 41.d5 Ke5 42.h3 Kd6 43.Kd4 Ke7 44.Ke5 Kd7 45.d6 Kd8 46.Ke6 Ke8 47.d7+ Kd8 48.Kd6 h5 49.gxh5 g4 50.h6 gxh3 51.h7, Black resigns. 20.Nd5 Rc4 21.Nxf6+ Bxf6 22.Qd5+ Kg7 23.Rxh7+ Kxh7 24.Qf7+, Black resigns. 18.Ne6 fxe6 19.Qxg6+ Kd8 20.Qh6 Bxd5 21.Qxe3 Bxb3 22.Qxb3 Kd7 23.Rd3 Qc5 24.Qc3 Qg5+ 25.Qd2 Qg6 26.Rd1 e5 27.Rd5 Rac8 28.Rxe5 Rc4 29.Re2 Rfc8 30.Qd3 Qg5+ 31.Kb1 R8c5 32.Rdd2 Qf6 33.Qa3 Rc6 34.Qe3 R6c5 35.b3 Rc3 36.Rd3 b4 37.Red2 Re5 38.Rxc3 bxc3 39.Qa7+ Ke6 40.Rd1 Qf4 41.Qxa6 Qd2 42.Qf1 Qe3 43.a4 Kf6 44.Qd3 Qc5 45.f4 Rh5 46.Qd4+ Qxd4 47.Rxd4 Rxh2 48.Rd3 Rxg2 49.Rxc3 Ke6 50.Rf3 Kd7 51.Kb2 Kc6 52.f5 Kc5 53.f6 exf6 54.Rxf6 d5 55.Rf3 Rd2 56.Rd3 Re2 57.Kc3 Re4 58.b4+ Kc6 59.Rd4 Re3+ 60.Kb2 Re2 61.Kb3 Re3+ 62.Rd3 Re4 63.Rc3+ Kb6 64.a5+ Ka6 65.Rc6+ Kb7 66.Rd6 Rd4 67.b5 Kc7 68.Rh6 Rg4 69.a6, Black resigns. At the Marshall Chess Club, former Chess Life and Atlantic Chess News editor Glenn Petersen will receive a journalism award from club president Frank Brady. The award ceremony begins at 6:30 this evening. If you think that you see a familiar chess player in an upcoming television commercial for HIP (Health Plan of New York), it may be FIDE Master Asa Hoffmann. Now that's hip! The winning streak for the New Jersey Knockouts was stopped at two by the Philadelphia Inventors on Monday night. And it won't get any easier for the NJKO. Their next opponent in the U.S. 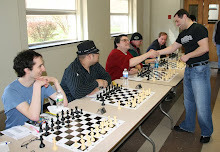 Chess League is the first-place Boston Blitz. 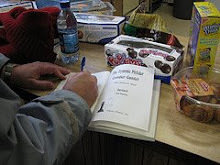 Paul Hoffman's new book King's Gambit has received favorable reviews, not only in Entertainment Weekly, People Magazine, and Newsday, but in The New York Times as well. I particularly enjoyed reading the excerpt on Kasparov's simultaneous exhibition game against Nelson Farber because I just played Farber this past Sunday at the Marshall Chess Club. It was a 70-move marathon. First I stood better. Then Farber missed a win. I reciprocated by missing a win of my own. Finally the game ended in a draw. This evening, in the U.S. 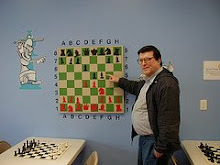 Chess League, the Philadephia Inventors will try to pass the New Jersey Knockouts in the race for a postseason berth. By reading David Remnick's 12-page article on Garry Kasparov in The New Yorker, I learned more than I needed to know about the upcoming 2008 presidential election in Russia! My favorite paragraph is the following one, regarding chess instead of politics. Garry Kasparov on "60 Minutes"
On Sunday, September 23rd, CBS aired Garry Kasparov: The Match of His Life on its 60 Minutes program regarding Kasparov's political opposition to the Putin regime in Russia. In week 6 of the United States Chess League, the New Jersey Knockouts defeated the Carolina Cobras in their match by a score of 1-0-3. According to Sarah's Chess Journal, former world champion Garry Kasparov's wife is a resident of New Jersey. So, too, is one of Kasparov's ex-wives. The New Jersey Knockouts of the U.S. 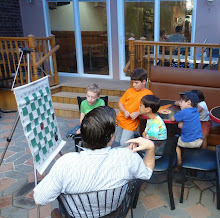 Chess League try for their second straight victory tonight against the Carolina Cobras. In his Blog Trekking, August 2007 round-up, Mark Weeks of About.com includes my blog post on Goeller Wins Honorable Mention. The new world champion of chess is Viswanathan Anand of India, who did not lose a single game in Mexico City.